Today I bring you a recipe I’ve been planning for months. Why so long you ask? That’s a good question. Is it hard? Nope. Did it take a lot of iterations to figure out? Nope. Does Lindsey greatly struggle with frying eggs pretty enough to photograph? Turns out, yes. Typically I scramble eggs because it’s way easier and I like to throw in a bunch of extra stuff anyway, but for the purposes of this recipe a fried egg is really my favorite combination. 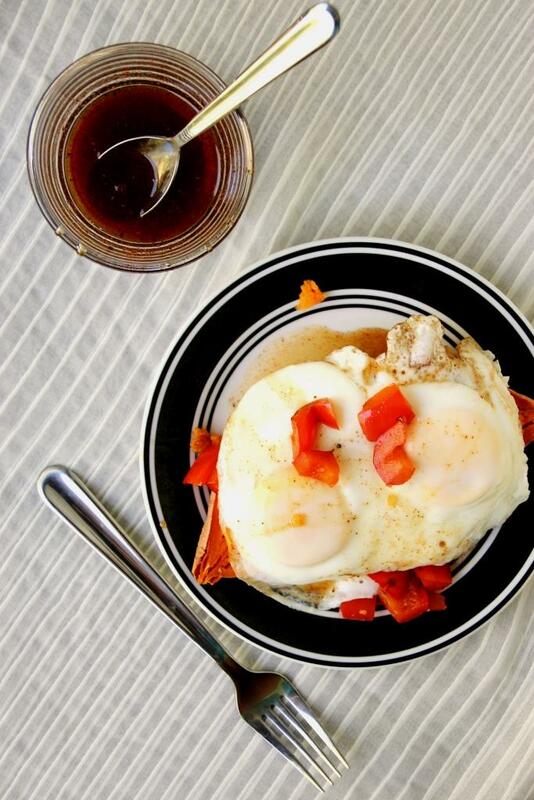 Ideally lightly browned on the bottom with the yolk still a bit runny, it’s a delicious savory meal for any time of the day. 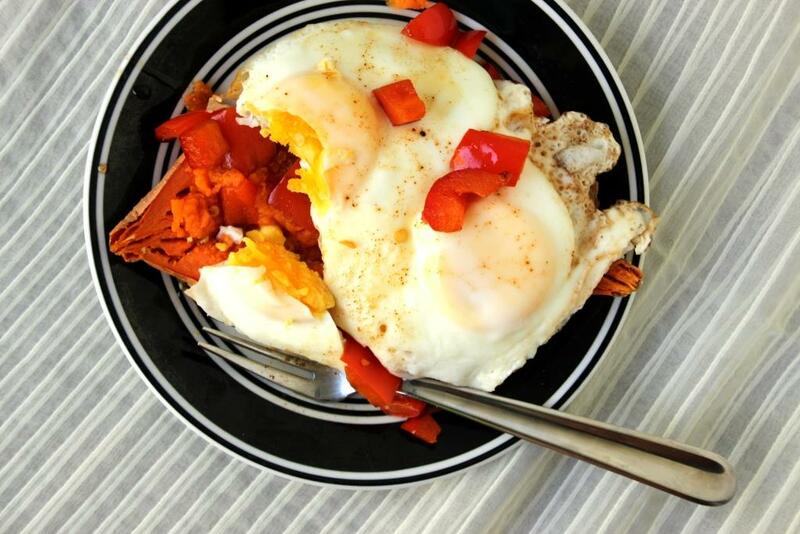 Mashed sweet potato, sautéed bell peppers, and a fried eggs are drizzled with a maple syrup and chipotle combo that compliments and juxtaposes the other flavors all in one delicious bite. I really meant to share this earlier in the summer but my aforementioned struggle with frying pretty eggs deterred me from doing so. As you can see by my over-medium (hard) version here, I eventually gave up. My own personal shortcomings should not prevent anyone from making this delicious recipe, so please forgive the lack of runny yolk. If, like me, you struggle with frying eggs, you can definitely go scrambled or poached or hard-boiled or any method you prefer. I find it easiest to use two separate small frying pans for the eggs and peppers anyway, but if you have better kitchen skills than I do feel free to do it all in one. For ease and quickness, I cook my sweet potato in the microwave, but you can also do a bunch at once in the oven if you’re feeding more than a couple of people. For myself I typically use just one egg, but after a 10-mile run I decided two was necessary. This is a fantastic post-run meal, a hearty brunch, a delicious lunch, or a fun dinner. I encourage you to make it for whatever you think is the best option, but really, they are all delightful. And if you have leftover chipotle syrup, it’s great on plain yogurt, on ice cream, on a diced peach warmed in the microwave, for dipping your bacon or sausage, or to top your usual griddle items like pancakes and waffles. Make a larger batch and store it in the fridge, or mix it up on the fly; totally up to you. In a small bowl, whisk together maple syrup and chipotle. Set aside. Vigorously scrub your potato, then use a fork to prick several holes all over it. Microwave 5-10 minutes, until easily pierced with a fork. Meanwhile, sauté bell pepper in oil over medium heat to desired doneness, about 5 minutes. At the same time, prepare eggs using preferred method. I like to use fried eggs, but poached or scrambled would be great also. 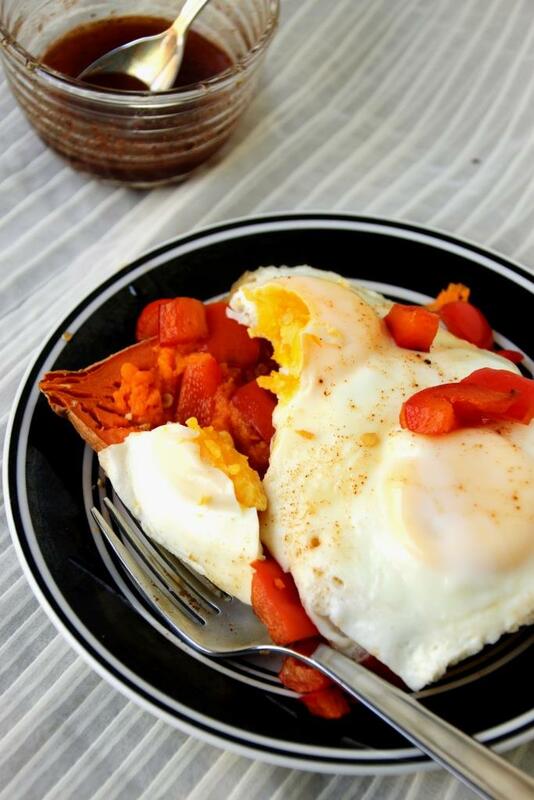 Just before the eggs are done (don’t forget about them), carefully slice your sweet potato in half. Use a fork to mash the insides and then drizzle with 1-2 tsp of the chipotle syrup. 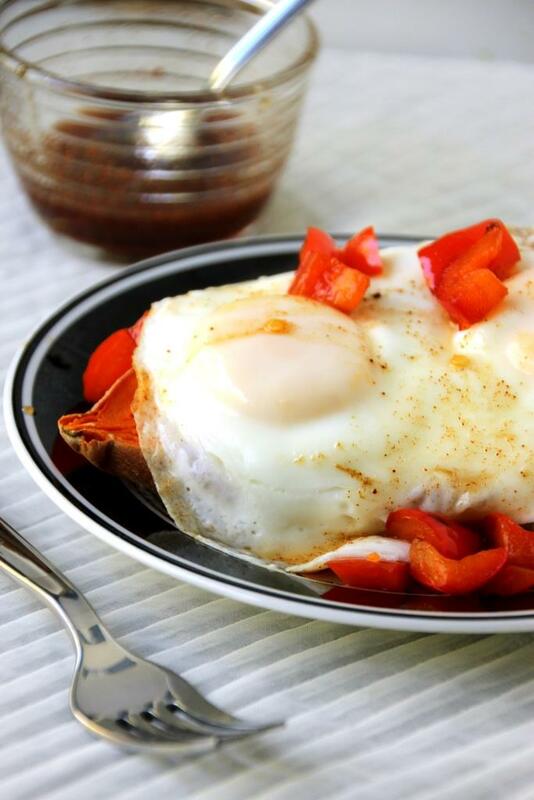 Top each potato will bell peppers and eggs, then drizzle with additional syrup.